We’d love your help. Let us know what’s wrong with this preview of Click, Clack, Peep! by Doreen Cronin. 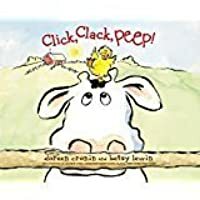 Farmer Brown, oh-so-sleepy, has a new, adorable - and LOUD - duckling to deal with in this addition to the award-winning Click, Clack series from the New York Times bestselling team who brought you Click, Clack, Moo and Click, Clack, Boo! There's more trouble on the farm, but Duck has nothing to do with it, for once. This time the trouble is a four-ounce puff of fluff who j Farmer Brown, oh-so-sleepy, has a new, adorable - and LOUD - duckling to deal with in this addition to the award-winning Click, Clack series from the New York Times bestselling team who brought you Click, Clack, Moo and Click, Clack, Boo! There's more trouble on the farm, but Duck has nothing to do with it, for once. This time the trouble is a four-ounce puff of fluff who just won't go to sleep, and whose play-with-me "peeps" are keeping the whole barnyard awake with him. To ask other readers questions about Click, Clack, Peep!, please sign up. Where does the duck get the headphones in this book. Was this something from one of the other previous books in the Click Clack series? The formula is beginning to wear thin. Effective reading primer. Causes lots of giggles. This book is more lyrical than the others in the series, and there's a fun twist at the end that my two-year-old thinks is hilarious. 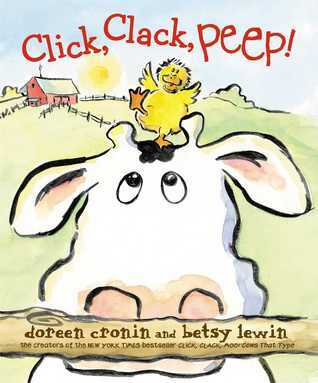 Doreen Cronin is at it again with her click clack series with, "Click, Clack, Peep!". "Click, Clack, Peep! is funny book that an parent can relate to. In this book the mama duck has a baby chick and the baby will not stop crying. As any parent, the farm animals work together to try and let the baby go to sleep. In the hilarious ways that the animals work together the reader will always be entertained. This book is a great read aloud and children will appreciate the humor and wit that the farm an Doreen Cronin is at it again with her click clack series with, "Click, Clack, Peep!". "Click, Clack, Peep! is funny book that an parent can relate to. In this book the mama duck has a baby chick and the baby will not stop crying. As any parent, the farm animals work together to try and let the baby go to sleep. In the hilarious ways that the animals work together the reader will always be entertained. This book is a great read aloud and children will appreciate the humor and wit that the farm animals provide. Although this book is a series the readers do not have to read the first book, "Click, Clack, Moo! 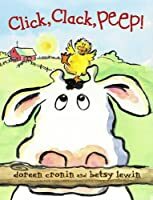 ", which is great for readers to appreciate the book more because they already understand the humor and wit of the farm animals from the previous book, however Doreen Cronin does a great job as showing the animals' personalities throughout both books. Baby Duck has just arrived at the farm and all the animals are eager to welcome her... until she refuses to go to sleep. Why I started this book: I love Cronin, and eagerly await any book from her. Why I finished it: The book was clever and fun, but I thought that the adults would smile the most at this book until the surprise end. The kids will love the end. Another of Cronin and Lewin's classic Click, Clack book. I liked the simple text and cute pictures in this one. I could successfully use this in my preschool program. The story line is entertaining and parents will certainly identify with this story. The last spread is the best part. Otherwise, eh. This story takes place on a farm. On farmer Brown’s farm a baby duck hatched and all the other animals watched in excitement. The baby duck spent the rest of the day playing and making noise. As nighttime approached and all the animals on the farm got tired, the baby duck continued to peep. All of the animals tried to get the baby duck to be quiet by singing lullaby’s, lowering the shades, and knitting a blanket, but nothing worked. Duck then took maters in his own hands and had to find a way t This story takes place on a farm. On farmer Brown’s farm a baby duck hatched and all the other animals watched in excitement. The baby duck spent the rest of the day playing and making noise. As nighttime approached and all the animals on the farm got tired, the baby duck continued to peep. All of the animals tried to get the baby duck to be quiet by singing lullaby’s, lowering the shades, and knitting a blanket, but nothing worked. Duck then took maters in his own hands and had to find a way to quiet the baby duck without disrupting farmer Brown. I thought this book was great and believe that young children would really enjoy it. What initially caught my eye was that this book was from the same authors that wrote the New York Times bestseller Click, Clack, Moo: Cows That Type. One literary element in the story that I enjoyed was how it included animal sounds. Children have practice with these sounds and including them in the book can give them more confidence when reading the story on their own. One design element that I enjoyed in the story was that the animal sounds were in different fonts and were sometime tilted. I believe that these two elements work together to create meaning because they make children interested in the story and it will make them want to read the story more than once. Overall, I really enjoyed this book and think that all young children would enjoy it. A baby duckling is born, but she will not go to sleep! The animals try everything until finally Duck is able to get to sleep. Phew! I like the illustrations in this book because they are bright and look almost like they were made with water colors. The repetition in the book also makes it easier for young readers to follow along and join in. If I were to use this in my classroom, I would probably read it aloud and then have a craft project that followed. There is a craft project that I found on A baby duckling is born, but she will not go to sleep! The animals try everything until finally Duck is able to get to sleep. Phew! I like the illustrations in this book because they are bright and look almost like they were made with water colors. The repetition in the book also makes it easier for young readers to follow along and join in. If I were to use this in my classroom, I would probably read it aloud and then have a craft project that followed. There is a craft project that I found on Pinterest that lets students make a tiny egg with a pop out that looks like the chick is being hatched. There are only a few steps to the project and it is simple enough for younger students to follow. I would probably use this book and the craft project in kindergarten and first grade, around springtime when ducklings and other baby animals are also being born. A cute book about remembering. Barnaby is a young little bunny that remembers everything! Or does he really? Silly Barnaby loses his glasses right on his own face. This book is a feel-good read. This funny story will appeal to children, being very relatable in many aspects. This will teach you to be able to laugh at yourself when you forget about something. I found the illustrations to be very cute. This little bunny is shown running around his house in which he has made a little mess of. Every A cute book about remembering. Barnaby is a young little bunny that remembers everything! Or does he really? Silly Barnaby loses his glasses right on his own face. This book is a feel-good read. This funny story will appeal to children, being very relatable in many aspects. This will teach you to be able to laugh at yourself when you forget about something. I found the illustrations to be very cute. This little bunny is shown running around his house in which he has made a little mess of. Every little thing that he forgets to do is very relatable to kids, like handwashing and misplacing clothes. This is a book that kids would enjoy. It teaches us that we should be confident in what we are good at but also, we should be mindful in what we do. Getting over confident could cause us to make mistakes, like when Barnaby forgets to wear pants to school. The farm animals of Farmer Brown are bustling with excitement as they anticipate the hatching of a duck egg. But, that excitement soon changes to exhaustion as the animals must find a way to get the baby duck to stop “peeping” so they can get some rest. As usual, the animal’s success comes with a funny twist and surprise for Farmer Brown. This book is recommended for ages 4 - 8, preschool - third grade. 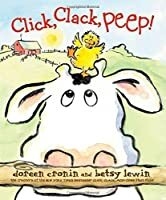 Anyone that is a fan of Doreen Cronin's Click Clack series will not be disappointed with this The farm animals of Farmer Brown are bustling with excitement as they anticipate the hatching of a duck egg. But, that excitement soon changes to exhaustion as the animals must find a way to get the baby duck to stop “peeping” so they can get some rest. As usual, the animal’s success comes with a funny twist and surprise for Farmer Brown. The use of literary devices throughout this entire book is so beneficial and allows teachers to use it as a mentor text. The onomatopoeia used throughout the book is worth noting because children find words like this intriguing. I know many kids learn the sounds animals make in response to learning the word, so this is just another way to reinforce that learning. This story made me laugh. A new baby duck arrives on the farm, and when all the other animals are wanting to sleep, little duck peep, peep, peeps, and keeps everyone awake. Finally one has an idea of how to get the baby to sleep ... much to Farmer Brown's dismay when he wakes up in the morning. Funny. Great illustrations. I highly recommend this book. It was written by the same author as the Click, Clack, Moo. It goes through the animal noises and as a baby duck is born the barn animals have to learn to cope. I read it for class as a picture book and enjoyed it. Short, sweet and an unexpected ending, which is great for the kiddos! If you choose to do sound effects, and trust me you should, it makes the story even more awesome! Read during Preschool Play on August 10th, 2018. The chickens sang a lullaby. The sheep knitted a blanket. I laughed out loud...or at least nearly did! I chuckled softly to my stack of books...I was in the library. Fresh and friendly fun illustrations. The farm has a new baby, but he’s keeping the Whole farm awake! What is Farmer Brown going to do? ••• This was cute. My kids love this Click Clack series and this one was no different. Not as thrilling as typing cows or spooky ducks, but a fun ride all the same. Baby Animal Story Time. Appropriate for Toddlers and Preschoolers. Baby duck arrives on the farm and will not go to sleep. He peep peep peeps all night long until the duck comes up with a solution. Read at church to a rapt audience. Suitable for even the youngest readers (though this wasn't the board book version - read it out loud to gnawers). The farm has a new baby...a baby duck is peeping his way through the day and night. The other animals try to get him to go to sleep. My children love these characters. As a young mother I complete understand Duck’s need for sleep. Trivia About Click, Clack, Peep!